@d-healey No... I said they are based on waveguide synthesis. 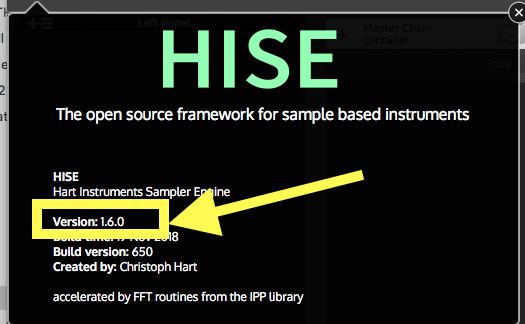 For example, the Audiomodeling website straight up says that about their SWAM strings. Based on waveguide synthesis. Karplus-Strong is just a simple, early form of waveguide synthesis. 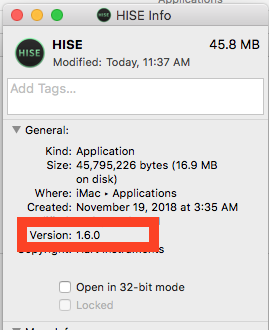 I installed it and the Version still says 1.6.0. Is this a type or do I really have the newest version? Yes, it's a typo, the build system didn't update the version correctly (the windows script works, but the macOS shell script failed somehow). I'll upload a more recent build soon. Ah, it's a typo, good to know, i downloaded it several times on my mac with the same result, hehe.. But one question, i started a project in Hise by myself, too. I created a new project and started building a first test with the sampler... After making several groups i stopped working on it and continued some hours later again. I loaded up the last project and everything i made in the sampler was gone so i re-loaded the project without any luck. It was gone, why is it that? @xenox-afl Did you load up the correct preset? .hip or .xml depending on which format you chose to save it as. @xenox-afl I've experienced this as well when switching between projects. I have to exit out of the program and start HISE again for it to work. you need to save to either an XML file or a binary .hip file. The project is just the root folder that is used to grab all required external resources. Also apart from the main XML / .hip files there are many different file types which are all saved individually - samplemaps, scripts, user presets. The idea behind this is to improve the workflow with version control systems like Git or SVN. Is there any reason to use the .hip format?